Below please find a list of question asked during the bidding process and later. Before posting a new one, please make sure to check FAQ, Accommodation and Scholarships pages. As of now there are no plans to make the conference carbon neutral (give us 2 days :) Przykuta 22:34, 23 March 2009 (UTC)). If my scholarship will be accepted I will try to arrive some days in advance and use my methane propelled car as a shuttle for anyone that needs transport. There are more questions on the accommodation talk page. You list only one place of accomodation with more than 100 beds -- the dorm 25 minutes away by foot. Many of the closer accomodation places do not list prices or # of beds. The accomodation places listed are the ones which are located within the Old Town and its immediate vicinity. The ones listed on the bid page may provide accomocation for 600 participants, mostly in the "budget" zone. Gdańsk University alone has an array of student hostels. Gdańsk Technical Universoty has a few more, located within the university's campus. There is an obvious trade-off between budget and more expensive accomodation. Our location guarantees access to both; we are confident that even places located further away from the Old Twown can be reached efficiently within 30 minutes using public transport; all of this should not to disadvantage visitors who opt for the cheapest accomodation available. The common space shown in this picture seems quite small. Would the parking lot area or some other outdoor space also be included as part of the social area? how would the space be setup? where could people sit as small, informal groups and just chat, eat lunch, take a break, etc? The museum and concert hall don't appear to be adjacent (next to each other). The distance between the museum and the concert hall is 415 ft / 126 m, which seems enough distance that the sessions in the museum will have less people in attendance (even in perfect weather). If it's raining, that would be really unpleasant, meaning that sessions over in the museum would not be well attended. Savannah, Georgia (172 ft / 52 m) between buildings - this is for another conference I helped organize (similar size to Wikimania) that had sessions split between buildings. My experience with that was that sessions in the secondary space were significantly less attended, even though the weather was terrific. It also affected the ability for people to gather informally and socialize. It's a challenge to overcome this when organizing a conference, with split venues. Also, if you are providing coffee/tea (I think necessary) during session breaks, it needs to be available in both buildings. Let me handle this question first, even though I have never lived in Gdańsk and I visited the city and the Ołowianka island many times as a tourist. I hope my local colleagues will be able to correct my eventual mistakes, since I was on the island quite a few years ago, when the Philharmonic was not even there and the Królewski Hotel was under construction. It was a charming place even then (before really revitalized! ), so I hope to explain why I like the idea to host the conference there, speaking from the point of view of a visitor. 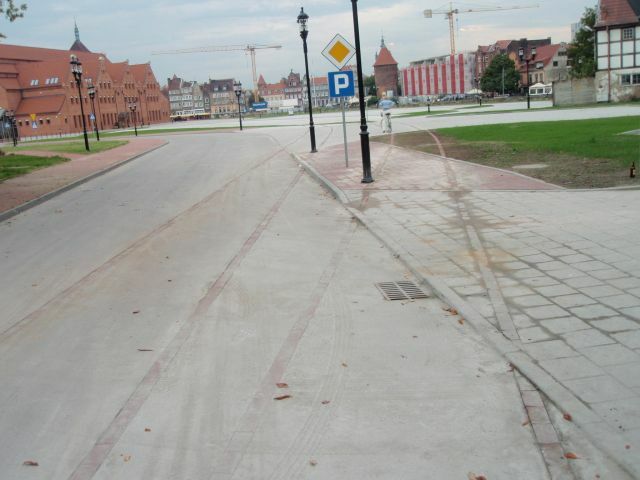 Although the island is located on the other bank of en:Motława, opposite the city centre, it is a very quiet place. There is no transit traffic and most tourists visiting the museum arrive by foot or via the ferry. This is a very important point given that Gdańsk is very busy with tourists, especially in the summer. So, once you leave the conference building, you will be in the pleasant area without facing city traffic and crowds immediately. Of course, those attractions are only a bridge or a 5-minute ferry trip away. Let's have a look through the window of the Królewski hotel, overlooking the south. If one looks at the upper left hand corner of the photo, there is a small bridge there. That's the way to reach Ołowianka by car, and behind the bridge there is marina and few hotels. The museum (as well as the Hotel Królewski) are built in the old granaries. The first big roof you can see ahead is the first granary of the Central Maritime Museum. So that's how the distance "feels like" in reality. On the right hand side you will see Żuraw, a large medieval crane, one of the Gdańsk landmarks. This is the Old Town centre and this are can be very crowded with tourists. Fortunately, we are on the opposite side. The ship permanently moored on the right side, en:SS Sołdek, was the first ship built in Gdańsk after the end of World War II. Given proper setup it it could serve as the Hacking Days or general Internet-access facility. The Philharmonic, the hotel and the Museum share a common yard, marked common space on the map. As we will be sole users of the surrounding buildings, I envision that this space could be turned into some kind of lively Wikimedia village, where people could sit, work, talk while enjoying (hopefully) beautiful Baltic summer. This place could be covered this some kind of roof (to protect from sun and eventual rain) and could make it the #1 social area of the conference. I think that area of this size could suit us well. Weather permitting this could let us to shift the gravity of the event outdoors, something that can rarely be enjoyed during a typical conference, and Wikimania is certainly not the "usual" one. So, with a bit of luck and hard work, we could balance the distances a bit, to reduce potential discouraging effect on the events held either in the Hotel or the Museum. 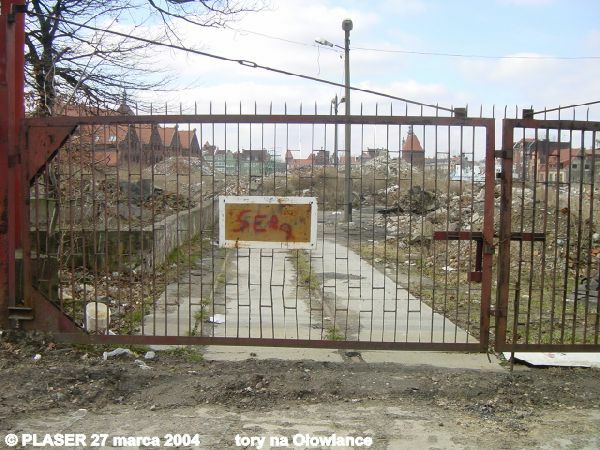 So I hope that we could really turn Ołowianka into the real Wikimania Island in the summer of 2010. Whether SS Soldek could be considered another social place - for example for smaller groups wishing to work on some projects away from the general crowd - this is certainly something to discuss and the Museum authorities are very open to this idea. Certainly there are many options to consider given the fact the we might "own" a larger part of the island into advantage. This will not come easy, but I am personally very excited to fly over there from Frankfurt (where I live) to work on site on planning and working out details of issues like providing wide-scale wireless access or serving food & beverages outdoors (if possible). But I believe that this gives us a chance to make this Wikimania quite a unique event - at least with less cars, less noise and a bit of sun. And with numerous accommodation options located in the "Długie Ogrody" area, most of the attendees will have a chance to walk to the site. I always reach Ołowianka from surroundings of Brama Złota/Wielka Zbrojownia by foot, like most of the city visitors do. The whole Old Town area is a pedestrian zone, with a very limited car traffic anyway. The recent Orange-Wikimedia deal made Orange a likely sponsor of the Wikimania 2010 as Orange group has a strong market share as an internet and cell phone operator in Poland. First of all, I am a Wikimedia Brasil volunteer. I can´t say I am experienced. In the months I've been involved with Wikimedia projects I´ve made some contributions, but most importantly I´ve developed iniciatives using Mediawiki software. I had planned to go to Wikimania in Buenos Aires but I gave up because my English speaking skills are quite poor. I would like to suggest that you adopt multilingual presentations. I would be interested in making a presentation in Portuguese. I look fowward hearing from you soon. Hi Saper, how are you doing. I wish you have been well. Thanks a lot for the google translation of the polish message you´ve wrote on my talk page. In fact, I have already been using that google tool. Unfortunately it is still confused, I think. But I'am willing to learn a bit more of the Shakespeare's tongue. Meanwhile I beg your patience. As you said, you are one of the volunteers will be working to create an appropriate setup for the best conference possible. Certainly this should include giving room to people like me, that don't feel confortable making speachs in their not own tongue, shouldn't it. Will you taking care of those BoF sessions? How could one know for sure that they will happen? This page seriously needs in-content links to more information, and some indication that this event is actually happening. There's less than three months remaining, and people are making the decision as to whether to go now. Yes, there's links to the FAQ and other things in the sidebar, but it's incredibly easy to miss them - the attention is drawn to the message, which is basically "Coming soon! [link to website in some crazy language with curly bits on the e's that most people won't understand]". This page was last edited on 15 June 2010, at 10:04.